Peeps- you either love ’em or hate ’em! PEEPS are everywhere this time of year….that sugary marshmallow treat is a staple in Easter baskets. I think they’re so adorable! Bright colours… cute faces… what’s not to love?! 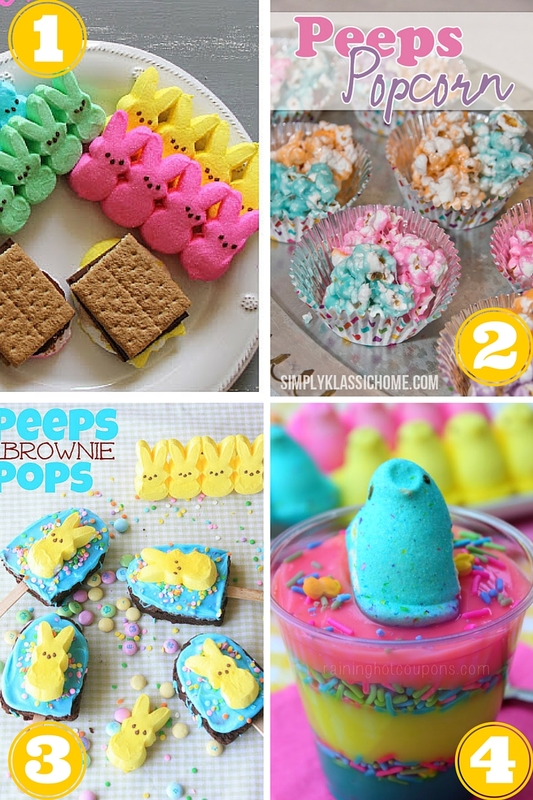 There are so many really fun and creative marshmallow peep treat ideas for Easter I just had to round them up! Plus, it’s a nice way to use up those peeps so you don’t end up eating a whole package in one sitting. Just click on the links below the photos to get the recipes and directions. What about you? Do you love ’em or hate ’em? What’s your favourite way to enjoy Peeps? Straight out of the package or “all fancy”? I hope you make one. If you do, come and share it on my FACEBOOK PAGE – give me a like while you are there. I’m sharing lots of fun stuff on Facebook. These are SO great! 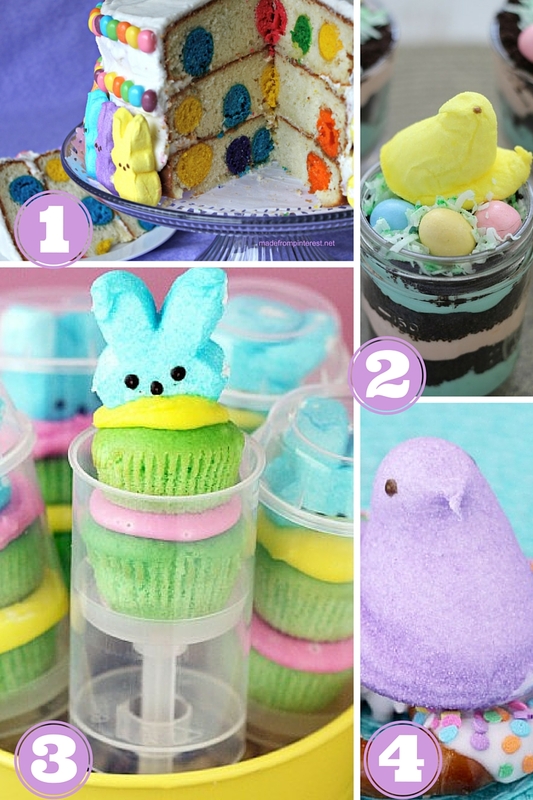 There’s so many things you can do with Peeps, the possibilities are endless! Those are some cute peeps treats! I love all of it. I hope I can make one this coming Easter. I’m one of the ones who hates them, but I bet my kids will like them. Making a Peeps house would be fun for the family. I didn’t know Peeps were marshmallows! I could try the s’mores! I love these ideas for Peeps!! I am not sure if I like them it’s one of those foods that can go either way for me depending on the mood. Peeps are my favourite Easter candy! I have been craving some chocolate covered peeps but I couldn’t find them at Walmart. I like peeps but I can only eat so many. You have shared a ton of fun ideas and things to do with Peeps. I noticed they have a ton of different flavors now. I might have to try a few. 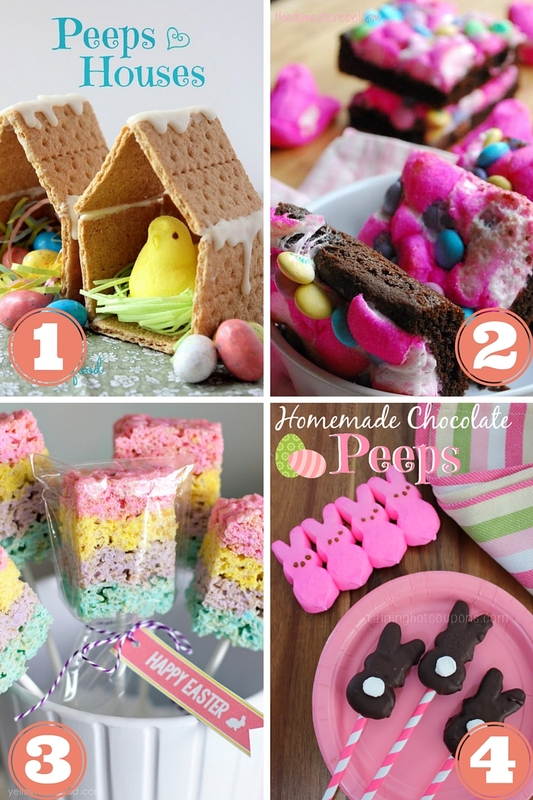 I am not a fan of Peeps–too sticky, sweet, and processed–but I love the cute crafts and dishes you can make with them. You include so many great ideas! These are such adorable ideas! I love Peeps, they’re so colourful and pretty much synonymous with Spring. I need to grab some before Easter hits! These ideas are awesome and my husband would love it. Me? Not so much. LOL I don’t know why they irritate me so, but hubby and the kids loves them so I am the odd one out! Aww, people are so clever with these. I’d love to make some cute treats using Peeps. I’m definitely in the LOVE peeps camp and so is my family! Those Peep push pops are really cute. My son-in-law loves PEEPS so I always have some on hand for him, my son and the grandkids. They are all so colorful and I couldn’t image Easter without PEEPS. I even serve a Make-Your-Own-Sundae-Bar and include PEEPS. These are all great ideas. Sign me up for that Peeps popcorn! That looks like a sweet treat that my kiddo would LOVE! I think this time of year is just so much fun with all the pastel colored treats. not a big peep fan, but these are some cute ideas. I liked the little house with crackers the best. Peeps are probably one of my favorite candies. I love them when they are about a week stale lol! YUMMY!!! I actually open up the packages a week before Easter. 😉 These are some great treats for next week! I have never tried peeps before but I would need to make veggie marshmallow versions as I am a vegetarian. Love the use of bright colour! These are such fun Spring ideas! We’re having Easter at our house and I think a lot of these would be such a hit! Love all the colors and different ways you can use them to make delicious treats. They are so cute and I enjoy watching to see how people are becoming very creative to prepare for the Easter. These are some really amazing ideas. We won’t be home until the day before Easter this year because we are on vacation. I might still do a couple of these and celebrate later. I think my toddlers would have a blast. Aw. The little houses are so cute. I used to looove Peeps; not so much anymore. When Grandma sends them to my daughter, I throw them out. Lol. Just too much sugar for her. Such creativity and innovation in these ideas. I’m not that creative with food ideas so I appreciate posts like yours. Colors are so bright and beautiful ! Loved it ! Oh my goodness, every idea was cuter than the one before…. how do I pick which one to do! Pinning to make several of them for next week! Oh my word. These are all so darling! I think we wan to make the peeps houses this year! So many adorable ideas. Even though I dislike Peeps,I think they make things look so cute. The colours are so bright and fun! Everything is so pretty. I love the spring colors. Is it unusual that I’ve never eaten a peep? We love Peeps in our house and one of my favorite snacks with them is Peeps Smores. I love the Push-Up Peeps treat that you shared. Peeps are always so colorful that they add pizzazz to any snack you make. I love this post as I love Peeps. I am totally loving all of these ideas to do with them and I do not understand how people don’t like them because c’mon they are so darn cute!!!! This post makes me want to go out and buy some peeps! Yum! I like them when they are practically stale though! lol! My husband LOVES Peeps. Me…not so much LOL. BUT…implemented into these recipes, I think I could be persuaded. That Peeps popcorn looks good! I am going to check these out. Such a cute way to implement Peeps into Easter. I can’t remember the last time I’ve actually eaten one but I have them in my home every year at Easter because it’s a tradition. The grandchildren like to eat them straight out of the package which is how I would eat them too. We use them to decorate our Easter cake every year and the Peeps always seem to disappear before the cake does. I simply must go check out that polka dot cake, it looks awesome! Those little peeps houses are adorable! 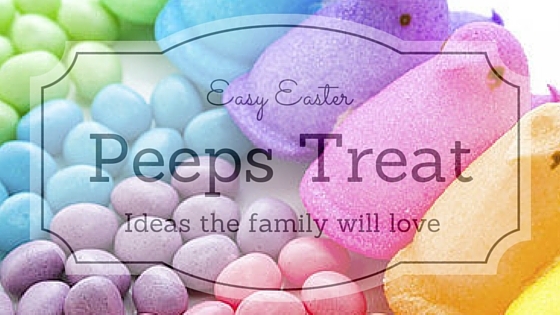 We are not fans of peeps in our house but they do make fun and easy gifts to give at Easter! I’ll have to pin this one to come back to! I can’t decide if I like Peeps are not! I love all of these ideas, I know my kids love to eat them. I have never thought to use them in recipes before, I may need to try some of these out for Easter this year. I love peeps Heather. I hate that I do because I should really watch my sugar intake…LOL! But who could resist them? They are yummy and cute! Thanks for sharing these awesome DIY with peeps! Makes my Easter more fun! These are SO adorable!! I want to make those Peep houses with my kids. They will LOVE them! There are some super cute ideas. We are always looking for new ideas to do to brighten the table! The peeps bring some pretty color and a unique ideas to the table. Pretty sure I am going to surprise my family this year!